Are you curious to find out the best things to do in Trasimeno Lake? Our mini-guide will show you the best things to do, typical foods to eat and places to visit in Trasimeno Lake, a wonder of nature! Enclosed between the green hills of Umbria, Lake Trasimeno is the fourth bigger lake of Italy. On its banks you can find breathtakingly beautiful villages like Castiglione del Lago, Passignano sul Trasimeno , San Feliciano, Tuoro sul Trasimeno, Castel Rigone and also fascinating villages further inland like the Etruscan Panicale, Lisciano Niccone, Piegaro. Let's begin our mini-guide on the best things to do in Trasimeno Lake from the three Trasimeno Lake's islands: Isola Maggiore, Isola Minore and Isola Polvese . Isola Polvese is the largest one; it is freely accessible although since 1995 belongs to the Lake Trasimeno Regional Park and offers visitors three points of interest : the fortress , the ruins of the Church Olivetana di San Secondo and the Church of San Giuliano. On Isola Maggiore, the only one inhabited you will find lots of things to see : the docking area (via Guglielmi ) with its buildings , the Church of San Salvatore, the ruins of the monastery church of the Sisters of St. Leonard , the ruins of the Tower of the Roman era, the Church of St. Michael the Archangel , the Chapel of St. Francis, the Rock and the source of St. Francis , the Church of St. Francis, Guglielmi Castle and the windmill. Isola Maggiore was one of the places of St. Francis of Assisi, who stayed there and meditated in 1211 . The third island , Isola Minore is private and not open to visitors . He is currently uninhabited , although until the fifteenth century appears to have been inhabited by many families. 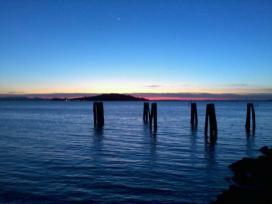 >> Do you want to discover Trasimeno Lake's treasures? Check it out now of the best farmhouses near Trasimeno Lake. One of the things to do in Trasimeno Lake is without doubt a tour of the islands by ferry! Leave your car in San Feliciano and catch the early morning ferry to Isola Polvese. After visiting Isola Polvese take the ferry to San Feliciano and go back to Passignano or Tuoro where you can catch the ferry to Isola Maggiore. After visiting the islands we suggest you to make the circumnavigation of Lake Trasimeno. Arm yourself with a road map and choose a location to start from to explore Trasimeno Lake and its views, we suggest you to start from Castiglione del Lago or Passignano. If you love bike, we recommend you to do it by bike even if it takes more days. 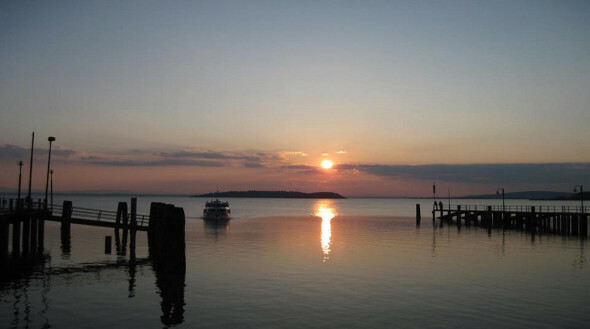 There are offers for vacation rentals and hotels in the areas of Trasimeno Lake! Click and Consult them immediately. Among the things to do in Trasimeno Lake do not forget a visit to the castles: Rocca del Leone in Castiglione del Lago, Torre dei Lambardi in Magione and the ruins of Castello di Zocco. Start the route in Castiglione del Lago with a visit to Palazzo della Corgna and the Rocca del Leone. The ticket is the same for both structures and the visit lasts from 2-3 hours, then take the car and drive to San Feliciano Passignano where you will find Torre di San Savino, Rocca Bagliona, the ruins of Castello di Zocco ed the town Monte del Lago. In Magione you will find the Knights of Malta castle and , high above the town, Torre dei Lambardi . Among the things to do on Lake Trasimeno we also recommend a visit to the Castle of Mongiovino, small fortified village in Panicale which also houses a beautiful church of 1513 in Bramante style dedicated to the Virgin Mary, the Sanctuary of Mongiovino . 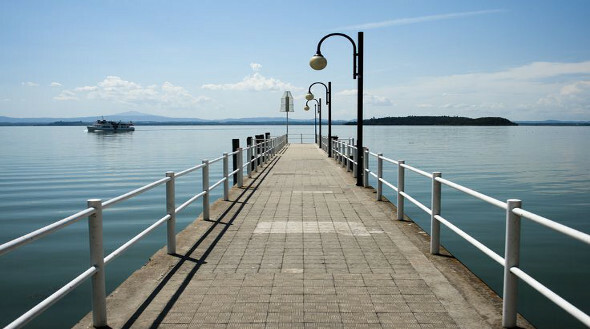 Our mini-guide can't miss some suggestions on what to eat on Lake Trasimeno. Typical foods are the fried perch fillets and the roasted goose. Another way to cook the goose is with pici, a kind of hand-made big spaghetti, served with duck sauce. See the best restaurants in the area of Trasimeno Lake! >> Click here and book. Seafood lovers can not miss carpa in porchetta , consisting of a 15-20 Kg carp baked and filled like a traditional porchetta, with bacon, fennel and other spices or odors . We suggest you also tegamaccio, a kind of fish soup made with fresh lake fish cut into pieces and cooked in the pan with fresh ripe tomato. If you've decided to visit Trasimeno Lake and taste Umbrian cuisine you should contact now farmhouses near Trasimeno Lake >> click this link.